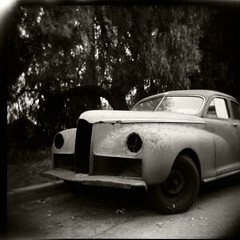 I have new Holga photos up on both my Flickr and JPG Magazine profiles. 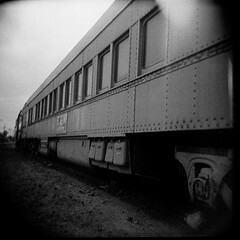 I’m just really loving getting away from digital photography occasionally and going back to shooting film, especially with the Holga. In case you need a refresher my dear readers, the Holga is a cheap plastic toy camera that leaks light through the edges, has a plastic lens, no control over the aperture or shutter speed (though there is a bulb setting) yet uses high quality medium format (120) film. The results are usually unpredictably beautiful! As usual when I shoot film through the Holga, there is no photoshopping involved (other than to save the scanned negatives as jpgs) so what you see here is how the camera shot it. So far, I have only loaded my Holgas with various black and white film (usually the Ilford Delta series of films, which is becoming my favorite film) but on my next outing, I will be loading up a roll of Fuji Velvia RVP100 color slide film and then cross-processing it to hopefully get some fun and unexpected results. Stay tuned!